Spanish grammarian of the first third of the thirteenth century. The assumption that he lived in the first third of the twelfth century (Geiger's "Jüd. Zeit." xi. 235; Grätz, "Gesch." 3d ed., vi. 110; Winter and Wünsche, "Jüdische Litteratur," ii. 183) is erroneous. He was probably a native of Toledo, where he had access to the famous Bible Codex Hilleli (David Ḳimḥi, "Miklol," ed. Fürst, p. 78b); subsequently he went to southern France, where he wrote "Gan Te'udot" (see below) at the request of Samuel and Ezra, the sons of Judah, who, according to Steinschneider (in "Z. D. M. G." xxvii. 558), areidentical with Judah b. Nathanael's sons of the same names, mentioned by Al-Ḥarizi. Jacob ben Eleazar's chief work, the "Kitab al-Kamil" (Hebr. "Sefer ha-Shalem"), written in Arabic, has long since been lost. 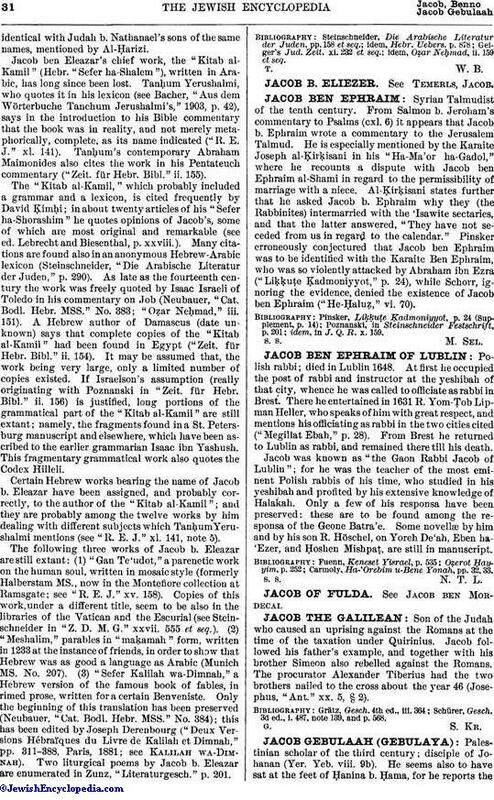 Tanḥum Yerushalmi, who quotes it in his lexicon (see Bacher, "Aus dem Wörterbuche Tanchum Jerushalmi's," 1903, p. 42), says in the introduction to his Bible commentary that the book was in reality, and not merely metaphorically, complete, as its name indicated ("R. E. J." xl. 141). Tanḥum's contemporary Abraham Maimonides also cites the work in his Pentateuch commentary ("Zeit. für Hebr. Bibl." ii. 155). The "Kitab al-Kamil," which probably included a grammar and a lexicon, is cited frequently by David Ḳimḥi; in about twenty articles of his "Sefer ha-Shorashim" he quotes opinions of Jacob's, some of which are most original and remarkable (see ed. Lebrecht and Biesenthal, p. xxviii.). Many citations are found also in an anonymous Hebrew-Arabic lexicon (Steinschneider, "Die Arabische Literatur der Juden," p. 290). As late as the fourteenth century the work was freely quoted by Isaac Israeli of Toledo in his commentary on Job (Neubauer, "Cat. Bodl. Hebr. MSS." No. 383; "Oẓar Neḥmad," iii. 151). A Hebrew author of Damascus (date unknown) says that complete copies of the "Kitab al-Kamil" had been found in Egypt ("Zeit. für Hebr. Bibl." ii. 154). It may be assumed that, the work being very large, only a limited number of copies existed. If Israelson's assumption (really originating with Poznanski in "Zeit. für Hebr. Bibl." ii. 156) is justified, long portions of the grammatical part of the "Kitab al-Kamil" are still extant; namely, the fragments found in a St. Petersburg manuscript and elsewhere, which have been ascribed to the earlier grammarian Isaac ibn Yashush. This fragmentary grammatical work also quotes the Codex Hilleli. 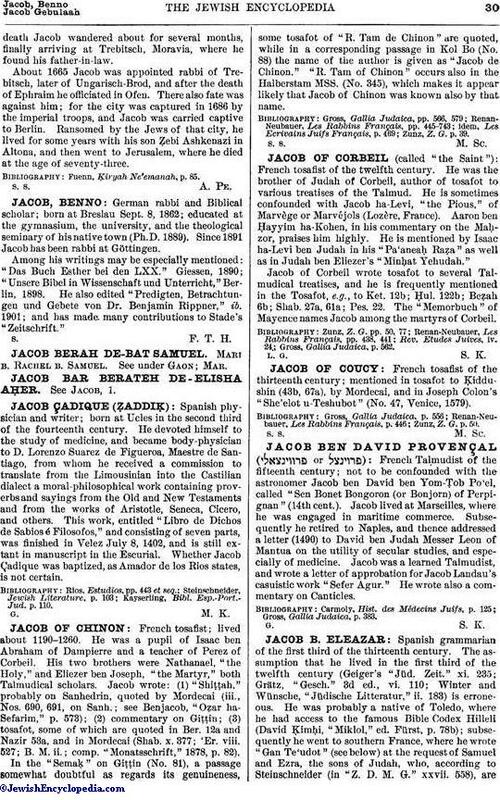 Certain Hebrew works bearing the name of Jacob b. Eleazar have been assigned, and probably correctly, to the author of the "Kitab al-Kamil"; and they are probably among the twelve works by him dealing with different subjects which Tanḥum Yerushalmi mentions (see "R. E. J." xl. 141, note 5). The following three works of Jacob b. Eleazar are still extant: (1) "Gan Te'udot," a parenetic work on the human soul, written in mosaic style (formerly Halberstam MS., now in the Montefiore collection at Ramsgate; see "R. E. J." xv. 158). Copies of this work, under a different title, seem to be also in the libraries of the Vatican and the Escurial (see Steinschneider in "Z. D. M. G." xxvii. 555 et seq.). (2) "Meshalim," parables in "maḳamah" form, written in 1233 at the instance of friends, in order to show that Hebrew was as good a language as Arabic (Munich MS. No. 207). (3) "Sefer Kalilah wa-Dimnah," a Hebrew version of the famous book of fables, in rimed prose, written for a certain Benveniste. Only the beginning of this translation has been preserved (Neubauer, "Cat. Bodl. Hebr. MSS." No. 384); this has been edited by Joseph Derenbourg ("Deux Versions Hébraäques du Livre de Kalilah et Dimnah," pp. 311-388, Paris, 1881; see Kalilah wa-Dimnah). Two liturgical poems by Jacob b. Eleazar are enumerated in Zunz, "Literaturgesch." p. 201.
idem, Oẓar Neḥmad, ii. 159 et seq.